Bubby and Bean ::: Living Creatively: GIVEAWAY // Win a $75 Voucher to Shabby Apple! 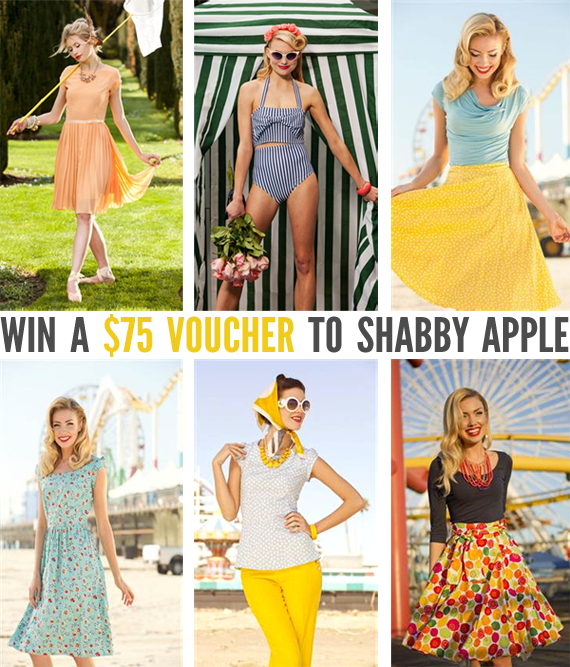 GIVEAWAY // Win a $75 Voucher to Shabby Apple! What better way to celebrate Friday than with a giveaway that involves shopping for clothes?! Today I'm teaming up once again with our friends over at Shabby Apple, this time to offer Bubby and Bean readers the chance to win a $75 voucher to go shopping on Shabby Apple 's website! I'm a big fan of their pretty vintage inspired dresses - they're elegant and timeless, and I've had my eye on several of the new styles they've just added for spring. They also offer really cute tops, bottoms, accessories, shoes, and swimwear, so no matter what your style, you're going to have lots to choose from if you win! TO ENTER: Just like Shabby Apple on Facebook and leave a comment letting me know you liked them. This giveaway is open through April 12th. The winner's name will be randomly chosen and announced here on the blog shortly after. Please note that the winner must have a U.S. shipping address. Congrat Jen! Please contact me at bubbyandbean (AT) gmail with your shipping address! New subscriber to Bubby and Bean, I adore your blog! I now follow Shabby Apple on Pinterest. I liked Bubby and Bean on Facebook. After Class is just one of the many favorite dresses on Shabby Apple's website. Thank you for introducing them to me! Just one dress? But I love the entire Ferris Wheel collection! I guess my favorite actual dress from Ferris Wheel is called Venice Beach, but I've been looking at the skirts for weeks now. Ok, I was already following you (and the Shabby Apple blog) on Bloglovin, but I've liked Shabby Apple on FB! And I've liked you on Facebook! I think that's everything. Love the Debutante and the Lemon Drop Skirt! I follow you on bloglovin and like Shabby Apple on fb! My favorite dress right now is the Snapdragon dress! I follow Shabby Apple on Pinterest! I follow Bubby and Bean on Twitter. Favorite Shabby Apple dress is the Sea Breeze! Already liked Shabby Apple on Facebook! Ooooh so many pretty dresses!!! This one is gorgeous though. So classic and simple. And I loooove the peplum! already follow shabby apple on twitter! I follow Shabby Apple on pintrest! Already follow you on pintrest! Phew! Did 'em all! I wanna win! It's a toss up between Alice and The Red Queen! I liked the giveaway page on FB. I follow Shabby Apple on pinterest. I follow Bubby and Bean on pinterest - sorry my follow name is Meagan Brockway or meggiereggie5. I don't just like Shabby Apple, I LOVE AND ADORE them!! My favorite dress is Tea Time...gorgeous! My favorite dress at Shabby Apple is the Lace march hare dress. I like the Belle de Jour dress! I follow Bubby and Bean by email. Super cute cloths. I Liked them!! Ooh such lovely dresses! I'm a blog follower and I like on Shabby Apple on Facebook (Amber H). Thanks! I've liked Shabby Apple on FB! I like Bubby and Bean on FB already! I LOVE the aphrodite dress. I LOVE the aphrodite dress! Following you on Bloglovin under Ani Barrington and liked Shabby Apple! The Blue Eyes dress is my favorite! Thank you for yet another AMAZING giveaway, Melissa! I would pick the Champs Elysees dress! I follow you and I like Shabby Apple on Facebook! My favorite dress is the V.P. dress! I really like the Tigris dress!